Posted by: Ash on October 25th, 2015, in Guides. Tags: Amazon Rainforest, Amazon River, Cruises, Iquitos. Iquitos is one of the favored places to enjoy a luxury Amazon cruise for quality conscious travelers. From Iquitos, you will voyage deep into the Amazon Rainforest’s Pacaya Samiria National Reserve, which is a gigantic flooded forest filled with some of the rainforest’s most diverse and fascinating wildlife. To match the magnificence of this incredible reserve, we have selected the top luxury Amazon cruises from Iquitos. Experience the Amazon Rainforest in high-class comfort led by some of the best naturalist guides in Amazonia. Iquitos is a city in the Loreto region of northern Peru’s Amazon Rainforest. As the largest city in the world unreachable by road, to arrive in Iquitos you take a 40 minute flight from Lima, Peru’s capital city. After landing in Iquitos, you will be met at the small Iquitos airport and transported in comfort to the dock of your vessel. The most attractive protected area of Amazon Rainforest accessible from Iquitos is the 2 million hectare Pacaya Samiria National Reserve. The reserve is widely known by nature lovers and river cruise connoisseurs for its beautiful scenery and high diversity of fascinating wildlife. As you travel deep into the Pacaya on one of the following luxury Amazon cruises, enjoy seeing the rainforest pass by your suite’s large windows to spot different animals and plants, such as colorful birds. 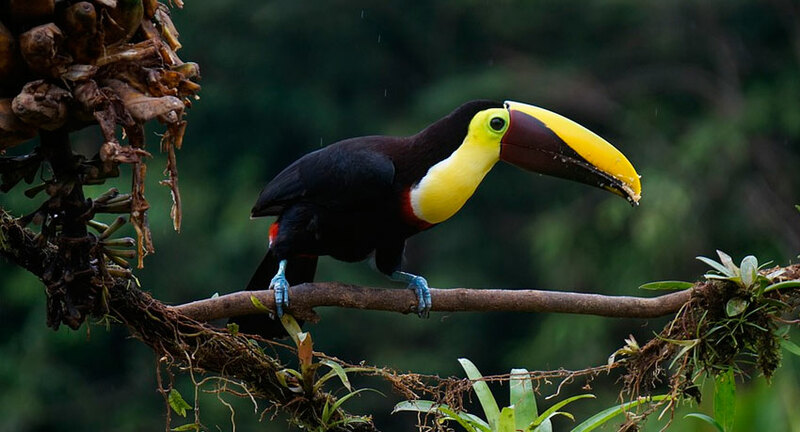 These include toucans, cotingas, tanagers, and macaw parrots. Even troops of monkeys will be seen making their way through the forest. We will now provide a selection of the best ways to make the most of the reserve on cruises where service, comfort, and cuisine match this incredible rainforested paradise. 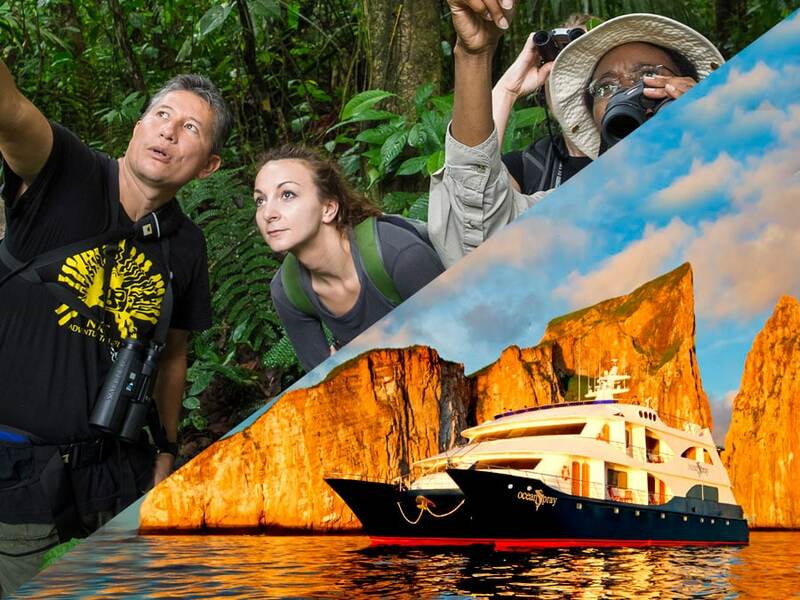 We will first list two cruises that provide longer itineraries into the reserve for deeper exploration. The Aria’s jet black hull ranks the vessel as one of the most attractive luxury cruise ships on the Amazon River. Featuring 16 very comfortable cabins, a spacious dining room, lounge areas, and outdoor jacuzzi, the Aria Amazon Cruise offers a very comfortable way to cruise the Pacaya’s waterways. Your suite features floor-to-ceiling windows to enjoy the wonder of the Amazon pass by as you relax on your luxurious bed fitted with the finest Peruvian linen. 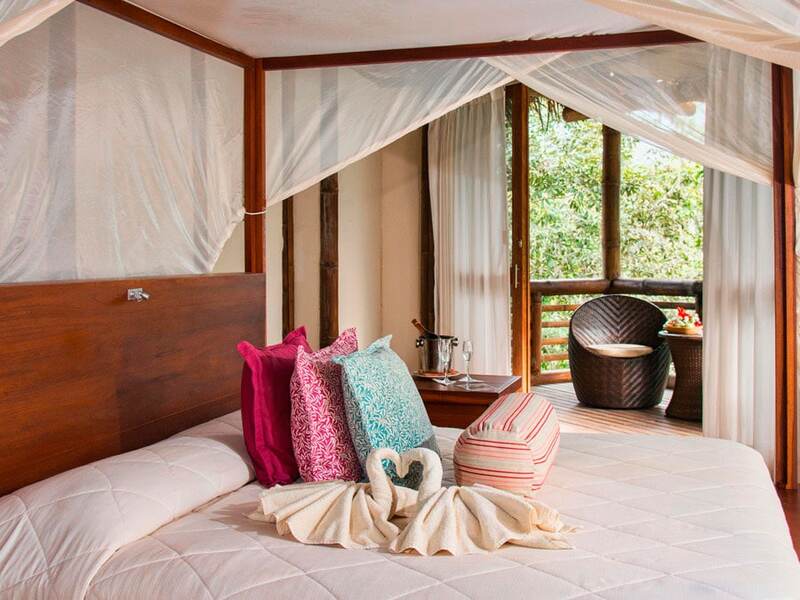 You can also choose to watch the rainforest from your daybed. Four of the suites can then be interconnected to cater for families and are designed to offer a naturally elegant style. The suites feature air conditioning, polished timber flooring, and a wall of glass for your observation window. Your ensuite is fitted with rain showers and organic bath products. In addition to the suites, the Aria Amazon Cruise features an indoor and outdoor lounge, observation deck, dining room, and exercise facilities. For dining, enjoy a variety of 5 star gourmet dishes from Chef Pedro Miguel Schiaffino. Despite the luxurious surroundings and first class dining experience, the focus of the cruise is on the Amazon Rainforest of the Pacaya Samiria National Reserve and its incredible wildlife. Head out with professional guides to spot of the reserve’s wildlife, such as several different monkeys, macaw parrots, toucans, colorful tanagers, caiman crocodiles, and a seemingly limitless variety of others. Enjoy skiff expeditions with a maximum of 8 guests to explore the Amazon and its waterways. 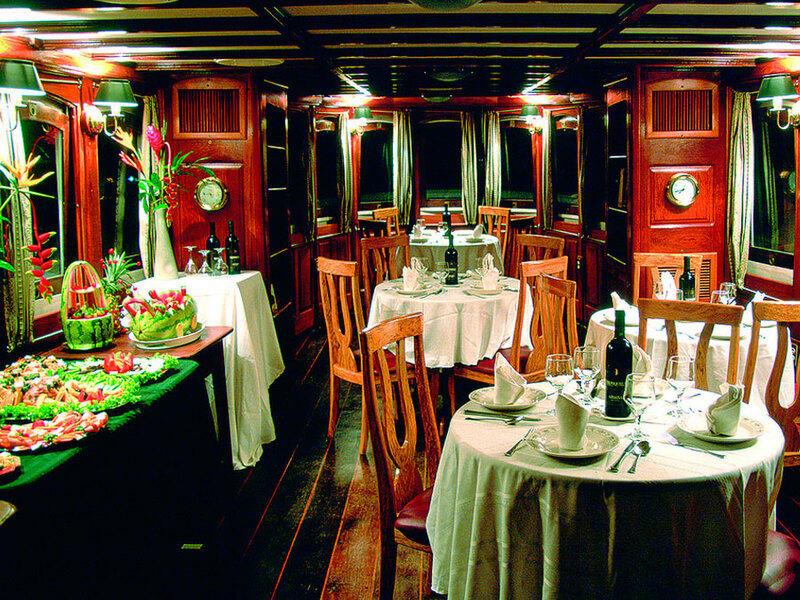 The Zafiro Amazon Cruise is one of the newest luxury cruises on the Amazon River The Zafiro Cruise is the luxurious sister vessel to the comfortable La Perla. On 4-day, 5-day or 8-day itineraries, travel deep into the Amazon Rainforest towards the Pacaya Samiria National Reserve. Explore the rivers of the Amazon, Ucayali, and Pacaya as your naturalist guide helps spot for several different monkeys, toucans, macaws, and sloths hiding in the trees. For relaxing aboard the cruise vessel between excursions, enjoy the jacuzzi, indoor and outdoor lounge, and your comfortable suite. There are some excellent places to enjoy the sunrise and sunset over the Amazon River. The comfortable suites are spaced throughout the 1st and 2nd decks. Some of the suites can interconnect to provide a fantastic family cruise. However, the largest and most luxurious option is the Zafiro Suite on the 2nd deck at the front of the ship. Enjoy some of the best views as you voyage deep into Amazonia. On the 1st deck, you can then find two large and spacious Master Suites, which each provide some incredible views. 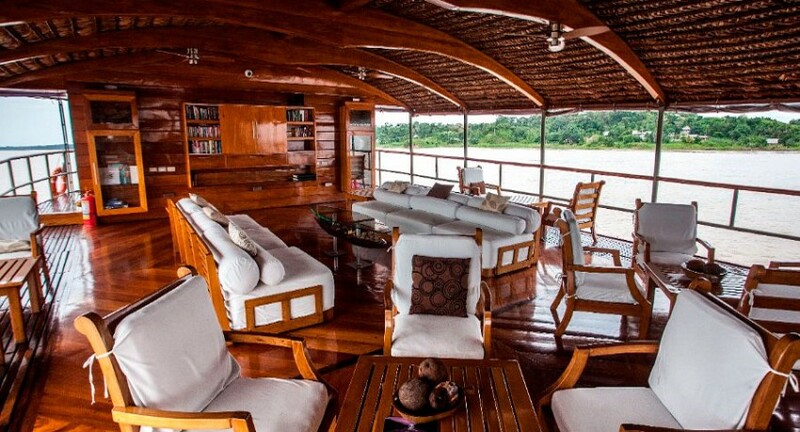 The Delfin I Luxury Cruise provides one of the most exclusive and spacious vessels to explore the Amazon’s waterways. With only 4 very spacious suites, two with your own private cold-water whirlpool, aboard the Delfin I Cruise you can really enjoy a personalized luxury cruise in the tropical environment. A step beyond luxury, the Delfin I Cruise really offers an outstanding experience. Enjoy world-class hospitality and service, gourmet cuisine with white glove table service, and panoramic windows in your exceptionally comfortable over-sized suite. All the suites then feature private terraces and three times a day personalized cabin service. In addition to the fantastic suites, guests enjoy a lounge area, bar, entertainment center, and superb dining room.Throughout the vessel, you can then find artwork made by the women of Puerto Miguel, which you can purchase. Profits from the artwork is directed to purchase school supplies for the community. Dining aboard the Delfin I Cruise is an experience in itself where every care is taken to provide the most delicious gourmet cuisine. Enjoy a variety of flavors, often using the natural ingredients from the surrounding rainforest. Staff is then on hand to provide a little information about each of the delicious dishes. The observation deck is another favorite feature. Fitted with large and luxuriously comfortable soft sofas, enjoy watching pristine rainforest pass by or choose to relax in the evening observing the stars. There is little competition for one of the best locations to enjoy the Milky Way. Your suite features 180° floor-to-ceiling panoramic windows, sofa bed in-suite seating, the finest Peruvian linen, and environmentally responsible bathroom amenities. Suites then feature silent a/c units, hot water, and small details to keep the experience a step ahead of the rest. 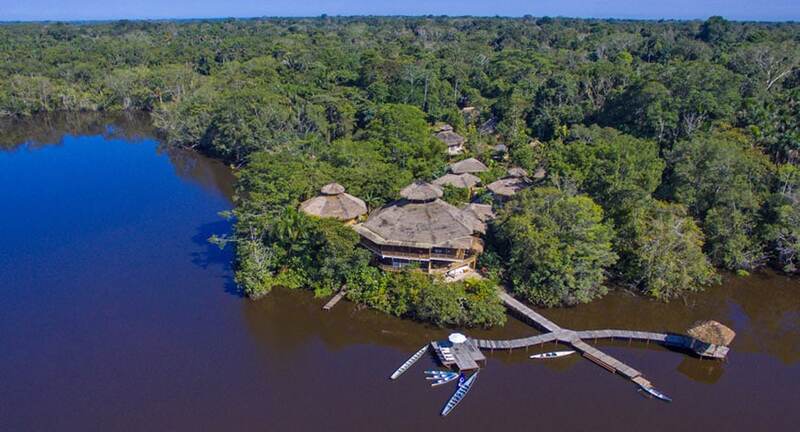 From this incredible base, explore the Pacaya Samiria National Reserve’s Amazon Rainforest on motorized skiff expeditions, forest walks in the dry season, and kayaking trips to spot many different Amazonian animals and plants. Animals you’re likely to find includes howler monkeys, sakis, squirrel monkeys, capuchins, toucans, macaw parrots, colorful birds, and large colorful butterflies. The Delfin II is an exquisite Amazon cruise vessel providing an experience akin to a floating boutique luxury hotel. The smallest details have been thought of to maximize your enjoyment in this world-renowned environment. Enjoy watching the rainforest pass by your window from a choice of either the very comfortable guest suites or the more spacious deluxe master suites at the front of the vessel. The large picture windows will decorate your suite with the Amazon Rainforest itself. The cruise vessel includes 14 large guest suites, including 4 master suites with 180° panoramic windows. Four of the suites can be interconnected to cater for families and each provides world class luxury lodging with a casual elegance. Enjoy a lovely ensuite bathroom with organic shower products, a sauna styled shower, and very luxurious bed with the finest Peruvian linen. In addition to the suites, the Delfin II provides a spa room, small exercise room, library, seminar room, observation deck, bar, and a beautifully decorated dining room. 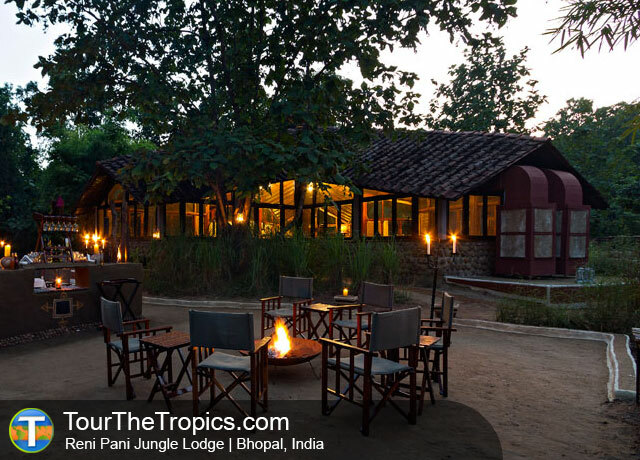 Here you will enjoy gourmet cuisine, from the fruits of the Amazon to international favorites. 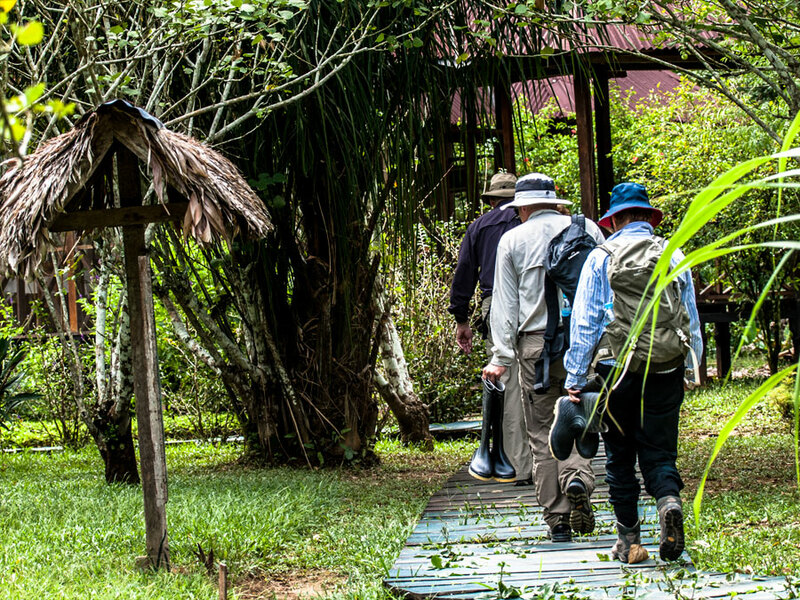 Head out into the Pacaya Samiria Reserve on forest walks in the dry season, skiff expeditions, and kayaking experiences to see a fascinating amount of Amazon Rainforest animals and plants, including different Amazonian monkeys, colorful birds, and many others. 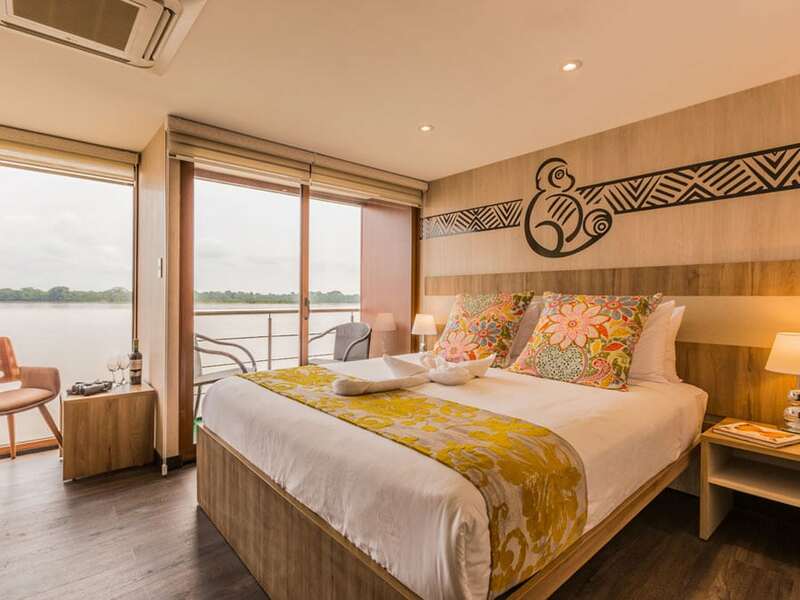 Designed to explore the Amazon Rainforest in comfort and provide suites for more affordable luxury for single passengers, the Delfin III offers a range of suites with floor-to-ceiling windows to decorate the vessel’s walls with the views of the rainforest. Previously known as the Amazon Discovery, aboard the Delfin III you can choose from the upper and lower deck, which offer an intimate and comfortable environment or the more spacious Corner Suites to treat yourself with more space and more windows. The Owner’s Suite then sits on the second deck as the most luxurious suite on offer. Hardwood flooring and panoramic windows decorate the elegant lounge area to keep you connected to this magnificent environment. Enjoy a cocktail or a wine while observing the Amazon in comfort. The dining room then serves gourmet cuisine often influenced by the surrounding rainforest. You will then explore the Amazon’s waterways on motorized skiffs led by some of the Amazon’s best naturalist guides. Travel deep down the Amazon’s waterways to find a variety of wildlife, including capuchins, howler monkeys, squirrel monkeys, colorful birds, and fascinating reptiles. Hopefully we will also spot pink dolphins playing in the water or investigating our presence in their flooded rainforest home.